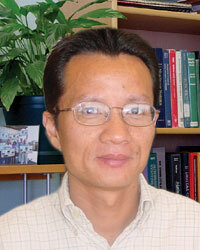 Jingchun Wu, Ph.D., is a recognized expert in computational fluid dynamics (CFD), finite element analysis (FEA), and optimization design. Dr. Wu has extensive industrial experience in medical devices, turbomachinery, hydraulic engineering, mechanical engineering, and information science. Since 2001, he has served as Senior Mechanical Engineer, Chief Scientist, and Director of Fluids Engineering for LaunchPoint, where he has played a lead role in the design and development of various turbodynamic ventricular assist devices (VAD), such as the Levacor®, PediaFlow®, and MiFlowTM VADs for children and adults. In 2009, Dr. Wu also joined Gravity Power, a bulk energy storage spin-off formerly known as LaunchPoint Innovations LLC, where he has been responsible for the design and optimization of the pump turbines for the proposed energy storage modules. Dr. Wu received his Ph.D. in Information Science from Nagoya University, Japan, his Master of Science degree in Hydraulic Engineering from Tsinghua University, and his BSME from Jiangsu University, China. Prior to joining LaunchPoint, he worked for the Changjiang Water Conservancy Committee, China, designing facilities for hydro power stations. In addition, as an assistant professor in the Department of Power Engineering at University of Shanghai for Science and Technology, Dr. Wu focused on the optimal design of turbomachinery, cavitation, and CFD. He managed the design and development of high-performance hydro-turbines and reversible pump-turbines at the Division of Thermal & Hydroelectric Systems, Hitachi, Ltd. in Japan. Dr. Wu also contributed to the development of Eulerian multi-phase flow codes for the lead Star-CD commercial software at CD-Adapco in London. As Senior Research Mechanical Engineer for Newport Medical Instruments, Inc. (now merged with Covidien), he led the development and optimization design of respiratory ventilators. Dr. Wu has 3 patents and has authored over 50 publications in his field. He has served as an Editorial Board member for two internationally-circulated, peer-reviewed journals: the American Society for Artificial Internal Organs (ASAIO) Journal and Artificial Organs, for which he still serves.